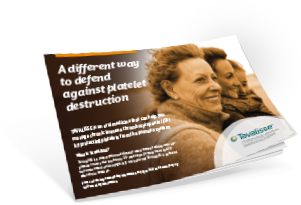 TAVALISSE limits platelet destruction by the immune system to raise platelet counts in the body and to help reduce the risk of severe bleeding. TAVALISSE specifically targets spleen tyrosine kinase (SYK), an important part of the pathway that leads to platelet destruction. TAVALISSE works differently than other treatments. TAVALISSE is the first and only oral treatment to work this way to treat adult chronic ITP.